Coren-Mitchell vs. Negreanu: Who Has the Better End of the Deal? 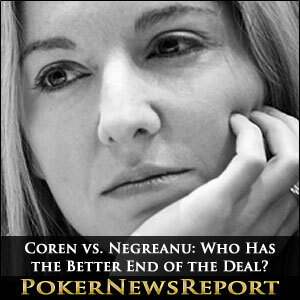 Home » Poker News » Online Poker News » Coren-Mitchell vs. Negreanu: Who Has the Better End of the Deal? Vicky Coren-Mitchell reacted first penalizing PokerStars for introducing pit games. Daniel Negreanu’s counter-reaction didn’t take long. Where do you stand? The poker community rejoiced when PokerStars Team Pro Vicky Coren-Mitchell announced that she ended her business relationship with the leading online operator in the niche. Many pros and recreational players alike praised Vicky’s integrity and decision to stick to her beliefs. I would personally feel like a hypocrite if I justified that it’s OK for me to take money from problem gamblers, but it’s not OK for the casino to do the same. If it’s wrong, it’s wrong no matter who profits. As much as we’d like to separate poker from gambling, poker played for money IS gambling. He’ll lose either way of course, the only difference is who gets his money. The casino, or the shark players taking advantage of the disadvantaged recreational player. Unfortunately, in his attempt to prove his case of not jumping off the PokerStars bandwagon, the Hall of Famer didn’t emphasize enough the basic difference between the game of poker and any casino game. While he mentioned that poker is indeed beatable and that the casino games are ‘unfair’ and ‘rigged’, he talked about the dream of becoming a pro as an illusion more often than not. Most of the wannabies-pro will eventually turn out to be losers who don’t have what it takes to climb the success ladder. I’m always careful to explain the difference between the essentially fair nature of poker, where we all take each other on with the same basic chance, and those casino games at unfavorable odds which can be (especially online) so dangerous for the vulnerable or desperate. I do agree that poker is a form of gambling, one with a skill element that can produce a positive expectation for the better players. But I also think that the vast majority of players are winners and not losers. In fact, in a poker room like The Bellagio, where I sometimes play, my estimates is that if you took a snap shot of everything playing, the number of winners would be about 70 percent. Whereas really, poker is a level playing field where – all else being equal – players have the opportunity to be net-winners in the long term; flair, work ethic, potential, and other factors permitting. What Amaya needs to learn from all of these discussions and analysis is that for every action there is a reaction. When its action affects the player either directly – rake increase, FX margin – or indirectly – the launch of the casino games and sports betting – there will be consequences. So far these consequences won’t influence the cash flow much but if the actions attacking the winning player continue, the business will suffer in the long run. I know that you take the best decisions that make sense for the company, for its shareholders, but I wish you to remember that the journey is long. Long term decisions will always pay better than short term ones. Dreyfus also hopes that PokerStars won’t forget its motto – Find the Poker Star In You – and won’t make Party.Bwin’s and Betclic-Expekt-Everest’s expansion mistakes.